The cats at Cat Napping owe it all to Ebony. She created her luxury cat hotels to combine her two passions, travel and animals. Ebony’s qualifications also reflect her life’s loves – she has an Advanced Diploma in Tourism Management and has worked as an international travel consultant. 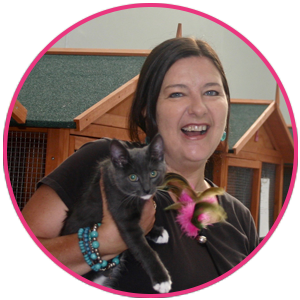 She has also completed Introduction to Vet Nursing at Gordon Institute TAFE, Feline Management with the Australian School of Pet Care and a Certificate III in Animal Studies at the University of Victoria. Ebony currently shares her home with her cat Bucket but she has room in her heart for every cat! Feel free to contact Ebony with any suggestions, complaints or compliments (or for a free tummy rub… if you’re a kitty of course!) at ebony@catnapping.com.au. Lesley has had animals as a major part of her life since forever. With 3 cats of her own now (and 3 friendly Chihuahuas!) she has taken a leap of faith and embarked on a total career change. After 25 years of teaching teenagers she has joined the Cat Napping team. Joining the team has meant her true passion for animals can now shine. 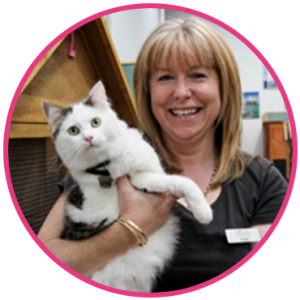 Lesley loves the variety of cats that stay, making sure there’s time for play and fun. Trudy has always had a soft spot for animals, after having pets all her life. After working in a variety of different fields over the years she never dreamt of landing a job working with animals until 9 years ago when she started working at Melbourne University in the canine blood bank as a vet assistant. It was then she knew she was meant to pursue a career with animals. After six years at the Uni it was time to find a new venture. Trying to find a job to fit in with her children was priority as family comes first (pets included). Cat Napping has fitted in with her life purrfectly as well as giving her the joy of doing exactly what she loves. When Emily was 5 years old she decided she wanted to be a cat. When she grew up a little and realised that was physically impossible and after watching a little too much Harry’s Practice she decided she wanted to help animals instead. Emily has looked after animals all her life, from cats, dogs, mice and horses. 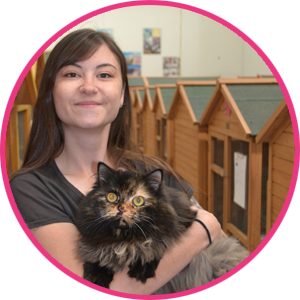 She has previously volunteered at the Geelong Animal Welfare Society in Cat Adoptions and her goal is to become a Veterinary Nurse. She has completed her Certificate II in Animal Studies and is currently studying her Certificate IV in Verterinary Nursing. Every day at Cat Napping is a dream come true for Emily as she is able spend her time caring for your cuddly and curious kittens! Jodie spent 15 years working in finance and 12 years raising her children before finding her purrfect job. A lifelong lover of animals, Jodie has owned a menagerie of pets throughout the years and currently has 3 dogs, 2 cats, 2 birds and a snake! Along with working at Cat Napping, Jodie fosters greyhounds and volunteers with Forever Friends Animal Rescue. For Jodie, her work is more than a job. She spends extra time with the most shy cats, encouraging them to come out of their shell and enjoy their stay as much as possible. Ever since she was a little girl, Vanessa has always been fascinated with animals. She spent most of her childhood years growing up on a farm where she got to help care for many animals including: cows, goats, chickens, cats and dogs. She now shares her home with 2 dogs (Chihuahua and Doberman cross), 2 cats and a leopard gecko. Vanessa has spent several years working as a veterinary assistant and kennel attendant caring for dogs, cats and horses. She enjoys traveling the world, seeing new places, meeting new friends and getting the opportunity to work with wildlife such as cheetahs, crocodiles and elephants. She is currently studying the Doctor of Veterinary Medicine program, to pursue her dream goal of becoming a veterinarian. 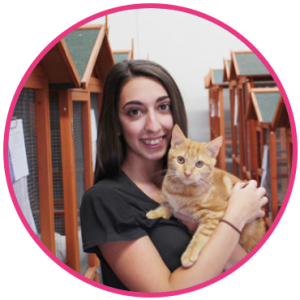 Cat napping is the perfect job for Vanessa because it allows her to spend her day caring for kitties and interacting with their owners. Being an international student from Canada, she understands how difficult it can be to leave your pets behind during vacation or study and is determined to provide the best care for clients until their loving owners return. Growing up, Kristen has always had a connection with animals, with her whole life revolving around her pets. She has owned everything from cats, dogs, mice, rabbits, guinea pigs, birds and fish and currently has two cats and a maltese terrier in her possession. Currently studying Veterinary Nursing, Kristen hopes to one day open her own veterinary clinic and rescue organisation. Working at Cat Napping has been the perfect introduction to Kristen’s career as she is particularly interested in feline behaviour. She enjoys learning how to interact with each different guest and getting to know their individual personalities. Ever since Shakira was young she has always had a love for animals and has owned a variety of animals in her family home. She is currently completing her Certificate III in Animal studies and hopes to one day become a Veterinary nurse for a rescue organisation. She would love to give back to the adoption agency she received her beautiful Tortoiseshell cat Pepper from. 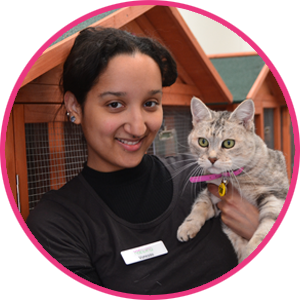 Working at Cat Napping is an absolute dream for Shakira – meeting and looking after all kinds of cats everyday doesn’t feel like work at all. Her favourite part of the job is sending the owners updates to assure them that their fur babies are in the best hands. Melissa has always been passionate about animals and their welfare. After working in various industries she finally decided to follow her passion by completing Certificate II in Animal Studies. After doing placement at Cat Napping, they asked her to join their team. Caring for and connecting with cats is rewarding and doesn’t feel like work for Melissa. Natasha has always had feline companions her entire life, and has found them to be simply beautiful creatures who have a rare quality, which is to give and receive affection. 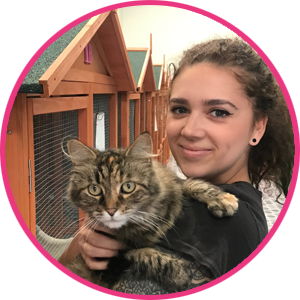 Having had 3 cats of her own, and always having a passion for cats, Natasha’s fascination with them led her to pursue an education within Animal Studies. Cat Napping is an ideal working environment for Natasha, as it allows her to interact daily with cats and their owners, giving them the reassurance that they need to ensure that their beloved fur babies are in a safe, clean and caring atmosphere, when their owners are away on holidays. 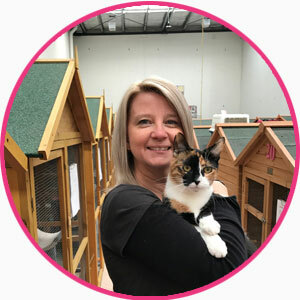 Natasha enjoys the many personalities that all her kitty clients have, and loves caring for them as well as recounting any of their antics to their owners, whilst they are away. 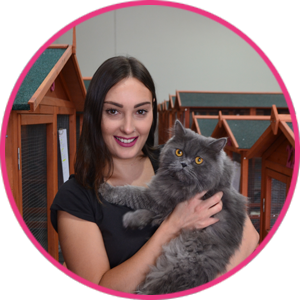 Providing outstanding care and service to the beautiful cats of the Cat Napping Suburban Retreat, is Natasha’s number one priority. If the cats are happy, Natasha is happy.